This thesis investigates the omission of functional elements in children’s early production. More specifically, it provides an extensive study of object clitic omission in early Italian. 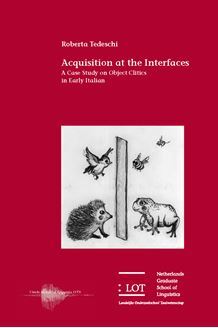 This phenomenon raises a number of questions concerning the nature of null objects in early grammars, the relation between argument structure and referentiality, the acquisition of syntactic and pragmatic aspects of referentiality, and the mapping between syntactic and prosodic structures. Three experiments aim at shedding light on the following issues: Are referen tial null objects a productive option in Early Italian? Does the phonological context in which a clitic occurs affect omission? Are clitics omitted because they refer to information that is easily retrievable from the preceding discourse? In this thesis it is argued that clitic omission can be partially explained by children’s tendency to omit unstressed syllables (such as clitics) that do not belong to a trochaic foot. Moreover, it is shown that clitic omission can be accounted for as the result of a non-adultlike integration of syntactic and discourse-pragmatic information. This study contributes to a better understanding of children’s ability to coordinate different aspects of linguistic knowledge in the early stages of language acquisition. It is relevant for scholars in the field of first language acquisition, as well as for theoretical linguists working on the syntax-discourse interface and on the syntax-phonology interface.